© Koren et al. ; Licensee Bentham Open. Taylor Spatial Frame (TSF) is a modern circular external fixator that, using a virtual hinge, is able to correct six axis deformities simultaneously. Despite the growing popularity of this method, few reports exist about its use in children and adolescents. To evaluate the effectiveness of TSF in correcting multiplanar deformities in patients with open physis, we reviewed the results of treatment in children who had at least two planes deformities of lower limbs. Over a period of 8 years, we treated 51 patients, 40 boys, 11 girls, with a mean age of 12.4 years (range, 2-16 years). All patients had open physis at the time of the TSF application. All patients had at least two deformities (angular and/or rotational). Fifty-five osteotomies (11 femoral, 44 tibial) were performed. Patients were divided into four groups: 13 with post-traumatic malunions, 18 with tibia vara, six with rickets, and 14 with miscellaneous deformities. Correction goal was determined as correction of deformities to population-average parameters of the lower limbs in frontal and sagittal views and normal mechanical axis deviation. Correction goal was achieved in all except one patient; four patients had recurrence of deformities post-operatively and were re-operated. Most common complications were pin tract infection (20 patients), delayed union (2), regenerate translation (1), post-removal femoral fractures (2), knee subluxation (1), nonunion (1), and one patient developed chronic osteomyelitis secondary to deep pin tract infection. TSF allowed accurate correction of complex limb deformities in children and adolescents with relatively few serious complications. Keywords: Adolescents, circular fixator, deformity, multiplanar, TSF, taylor. Deformity correction might be acute and gradual, using internal and external fixation. The presence and proximity of the growth plate might restrict the use of internal fixation in some patients (e.g., intramedullary nailing). External fixation might be monolateral or circular. Monolateral fixation is more comfortable, but correction of multiplanar deformities with a monolateral device might be very difficult. Circular external fixation, less comfortable but more forgiving and allows correction of multiplanar deformities. Ilizarov external fixation was the standard fixator for deformity correction for many years; this fixator is a very versatile external fixator and is a tremendous contribution to deformity correction. Despite many advantages, the correction of complex deformities with the Ilizarov frame requires a long learning curve and correction of rotational deformities remains a difficult task [1, 2]. The Taylor spatial frame (TSF) was introduced in 1994 and gradually became one of the most useful external fixators. Using TSF six axes deformities might be corrected simultaneously using a virtual hinge with computer accuracy. A typical TSF system is shown in Fig. (1). Despite the wide use of the TSF recently, there are only a few studies reporting the results of multiplanar correction, especially in immature patients. 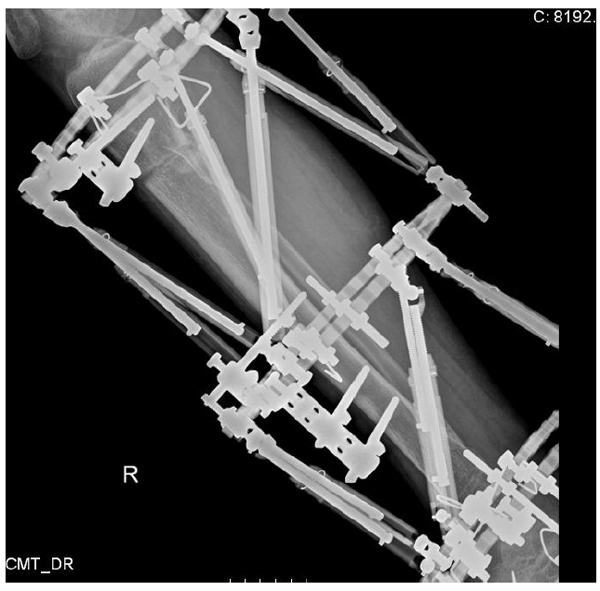 The purpose of this study was to examine the TSF accuracy in correcting multiplanar deformities of the long bones in the skeletally immature patients with open physis at the time of frame application. Distribution of the dimensions of deformity corrections. A clinical picture of a typical Taylor spatial frame. Type I (one-dimensional deformity correction) included all cases with leg shortening only, without any other axial deformity correction; Type II (two-dimensional deformity correction) included all cases with leg shortening and additional axial deformity correction in one plane (frontal, sagittal, rotational); Type III (three-dimensional deformity correction) included all cases with leg shortening and additional axial deformity correction in two planes (frontal, sagittal, rotational); and Type IV (four-dimensional deformity correction) included all cases with leg shortening and additional axial deformity correction in three planes (frontal, sagittal, rotational). We performed 55 osteotomies (11 femoral and 44 tibial). Thirteen patients had post-traumatic malunion, six had deformities secondary to rickets, five had juvenile tibia vara and thirteen had adolescent tibia vara, two children had deformities due to postseptic growth arrest, two fibular hemimellia and one patient from any of the following etiologies: tibial hemimellia, spondyloepiphyseal metaphyseal dysplasia, multiple epiphyseal dysplasia, fibrous dysplasia, posteromedial bowing of the tibia, hemiparesis, multiple hereditary osteochondromatosis, torsional deformity of the tibia, idiopathic proximal tibial valgus and angular deformity of the distal femur. 11 patients had correction of femoral deformities (five had combined tibial deformities correction) the other 40 patients had tibial deformities. All patients were examined pre and postoperatively using long standing digital x-rays from above the pelvis to the toes on the AP view. Lateral views of the extremities were obtained on the long standing views and on the separate femur and tibia non-weight bearing views. We examined all charts and long standing radiograms before correction, at the time of the frame removal and at least one year after removal of the frame. On long antero-posterior views, we recorded leg length discrepancy (LLD), mechanical axis deviation (MAD), lateral distal femoral angle (LDFA), medial proximal tibial angle (MPTA), and lateral distal tibial angle (LDTA). On the lateral radiograms we measured posterior distal femoral angle (PDFA) and posterior proximal tibial angle (PPTA). Rotations were measured clinically by thigh-foot angle (TFA) and position of the foot relative to an imaginary line from the center of the patella to the second toe of the foot. Correction goal was determined as correction of deformities to population average parameters of lower limbs in frontal and sagittal views and normal MAD . All frames had been removed at the time of manuscript preparation. Mean follow-up (from the day of TSF removal) was 63.5 months (range 17-118 months). Correction goal at the time of frame removal was achieved in all, except one patient. Partial recurrence of deformities at the latest follow-up occurred in four patients that were reoperated. For convenience, we divided the patients into four groups: post-traumatic malunions (13 patients); tibia vara corrections (18 patients); rickets (6 patients), and miscellaneous group (14 patients). The post-traumatic malunion group consisted of 13 patients, nine boys and four girls, with a mean age at the time of TSF application of 12.1 years (range 8-15 years). Mean shortening was 27 mm (range 5-80 mm). All patients had at least two deformities and one patient had three plane deformities. Average frame fixation time was 127.5 days (range 69-246 days). Ten patients had correction of tibial deformities: proximal tibial osteotomy (4 patients), mid tibial osteotomy (2 patients), supramalleolar osteotomy (2 patients). One patient underwent double tibial osteotomy with gradual correction and lengthening of 80 mm and one patient underwent correction through distal tibial osteotomy. Three patients underwent correction of femoral deformities through distal femoral osteotomies. The most common complication was superficial pin tract infection (5 patients), while one patient had delayed union and one patient underwent revision of fixation due to regenerate translation. All patients achieved correction goal, but one patient was re-operated twice until maturity due to recurrence of deformities . The tibia vara group: in this group were patients with proximal tibial varus combined with procurvatum and/or internal tibial torsion. This group consisted of 18 patients, two girls and 16 boys. Five had deformities secondary to juvenile tibia vara and 13 had the adolescent form of disease. Mean age of patients in this group was 12.6 years (range 3-16 years). All patients underwent correction through proximal tibial osteotomy. Two patients with sequelae of juvenile tibia vara and depression of medial tibial plateau underwent intra-articular osteotomies with completion of lateral proximal tibial growth plate closure. Seventeen patients had internal tibial torsion and eight procurvatum of the proximal tibia. Average frame time fixation was 108.2 days (range 82-148 days). Complications included pin tract infection in nine patients. All patients achieved correction goal. One girl with juvenile tibia vara who underwent elevation of medial tibial plateau and lateral proximal tibia and fibular epiphysiodesis had recurrence of varus and was reoperated several years later . The rickets group included six patients, three girls and three boys. Mean age was 14.1 years (range, 13-15 years). Five patients underwent correction of valgus and rotational deformities and/or procurvatum recurvatum and one patient varus and internal tibial torsion. One patient had bilateral deformities and underwent correction through bilateral distal femoral and right proximal tibial osteotomies. Proximal tibial osteotomy was performed in four patients and one patient was corrected through a distal femoral and proximal tibial osteotomy .Mean fixation time was 125.8 days (range 93-180 days). Correction goal was achieved in all patients. Complications included superficial pin tract infection in two patients, post-removal fracture of the femur in one, and transient EHL palsy. One patient had recurrence of the deformity on the latest follow-up and will be reoperated. The miscellaneous group is non-homogeneous and consisted of 14 patients (4 girls and 10 boys). This group included two patients with postseptic growth arrest, two patients with fibular hemimellia and one patient from any of the following etiologies: tibial hemimellia, posteromedial bowing of the tibia, spondyloepiphyseal metaphyseal dysplasia, multiple epiphyseal dysplasia, proximal tibial valgus, excessive tibial torsion and proximal tibial valgus, external tibial torsion and mild tibia vara, distal femoral valgus and external tibial torsion, multiple hereditary osteochondromatosis (MHE), deformity secondary to fibrous dysplasia. Mean age of this group was 9.5 years (range 2-14 years). Distal femoral osteotomy was performed in six patients (two bilateral), proximal tibial osteotomy in five patients, midtibial osteotomy in one patient, and two patients underwent correction of deformities through supramalleolar osteotomies. One patient with MHE underwent double level correction of the tibia through proximal tibia and supramalleolar osteotomy (Figs. 2a-2f). Mean fixation time in this group was 162.2 days (range, 81-333 days). Desired correction was achieved in 13 patients, and one patient with multiple epiphyseal dysplasia was under-corrected. Complications included superficial pin tract infection in four patients, nonunion and bone grafting in one patient, post-removal fracture of the femur, delayed union, knee subluxation, and one patient had chronic osteomyelitis. Long standing x-rays showed bilateral valgus deformities of tibias, more prominent on the right side. The CORA (Center of rotation of angulation) is marked at the level of right tibial tubercle (Red lines crossing) and just above the ankle joint (Yellow and red lines crossing). Clinical picture of the patient. Double level correction of the tibia at the proximal tibia and supramalleolar level. Long x-rays showed normal mechanical axis deviation. Clinical picture after frame removal. The Ilizarov method of deformity correction and limb lengthening was the major contribution in the field of deformity correction in the last century [4, 5]. This method remains the basis for deformity correction using internal and external fixation [3, 6]. Deformity correction in children might be challenging due to the proximity of the open growth plate; therefore, some methods of correction appropriate in practice for adults (e.g., intramedullary nailing) are contraindicated for immature patients. Correction might be acute or gradual. Acute correction is not always possible, especially in cases of deformity with shortening that so often occur in children with partial or complete growth arrest of the physis, where external fixation is the mainstay of correction in those cases. The Taylor spatial frame enables correction of angulation and translation in the coronal, sagittal and axial planes, enabling six-axis correction simultaneously. Contrary to the Ilizarov frame, there is no need for frequent frame adjustments and building hinges to correct multiplanar deformities. With TSF all deformities are corrected using the same frame using a virtual hinge (5, 11, 19). Long learning curve is required in order to master correction using an Ilizarov frame for complex deformities. Despite the wide use of TSF in practice, there is little description of the accuracy of correction, and especially about multiplanar correction in immature patients with open physis. Several articles have described the results of treatment in children with fractures and post-traumatic deformities treated with TSF. Ganger et al. reviewed the results of treating 22 patients with 25 post-traumatic lower limb deformities in young adults (mean age at the time of correction was 22.7 years). Only two patients in this study had residual mechanical axis deviation at the latest follow-up. Eidelman et al  analyzed the results of treatment with TSF of post-traumatic deformities in children and adolescents. There were 18 patients with a mean age of 13.1 years and equal numbers of proximal, medial and distal tibial malunions. In all patients, restoration of mechanical axis and length was achieved with minimal or no difference compared to anatomical parameters. Similar conclusions were achieved in several other studies in children with fractures treated with TSF [8-11]. Several studies investigated the treatment of children with limb deformities with the TSF. Naqui et al reviewed 53 patients treated with 60 frames on 55 limbs . Forty limbs had no final deformities, 12 limbs had mild residual deformities and three limbs needed further treatment. In 2006, Eidelman et al. reviewed the results of treatment of 31 children (44 frames) with various deformities. Most patients achieved anatomic correction of deformities and, despite many complex cases, results were encouraging. The most common complications in this study were superficial pin tract infections (45%) and three patients suffered from post-removal femoral fractures. Marangoz et al. analyzed the results of treatment of 20 patients with 22 femoral deformities of multiple etiologies treated with TSF . Only one patient was not corrected to within 3° of normal with regard to femoral deformity. Blount disease is an ideal example of multiplanar deformities. Usually additionally to varus deformity on the coronal plane there is significant procurvatum on the sagittal view and internal tibial torsion that makes this deformity a complex three-dimensional deformity [14, 15]. Feldman et al. reviewed the results of treatment of 19 patients with tibia vara (22 tibias). Mean age of patients in this study was 9.9 years (range 3-16 years). Twenty-one tibias were corrected to within 3° of normal in the sagittal and coronal planes. Most of their patients underwent concurrent fibular osteotomy. In 2008, we published the results of treatment of eight patients (10 tibias) with adolescent tibia vara . All patients underwent only proximal tibial osteotomy without osteotomy of the fibula. All patients achieved precise correction of deformities and there were no complications related to the fibula during and after deformity correction. In our current study, one girl with sequelae of juvenile tibia vara had recurrence of deformity despite lateral epiphysiodesis and intentional overcorrection to the valgus to prevent rebound of deformity. We believe that this outcome is probably related to incomplete closure of the lateral tibial proximal physis. Bar-On et al. treated four patients with elevation of the medial tibial plateau, lateral hemiepiphysiodeis and gradual correction through proximal metaphyseal tibial osteotomy using the TSF . Two patients had recurrence of proximal tibial varus after correction, attributed by the authors to recurrence of the varus to incomplete epiphysiodesis or mild distal femoral varus. The smallest group in this study was the rickets group. Usually, these patients need correction of angulation and rotation of several bones. Correction of angulation in patients with open physis might be achieved using hemiepiphysiodesis  but, in severe multiplanar deformities, this approach is not always possible . Some patients in this group underwent a combination of corrections using guided growth, acute correction and TSF . In 2010, Rozbruch et al. questioned whether the TSF can accurately correct tibial deformities. They retrospectively reviewed 102 patients (122 tibiae) that underwent tibial osteotomy with gradual correction with the TSF. Mean age of patients was 39 years (range 5-72 years). This is the largest cohort of patients treated with TSF described until now in the literature. Treatment goal was overcorrection of the MAD to 6-12 mm medial or lateral, depending on the presenting problem. Gradual correction of all tibial deformities was accurate and with few complications. We believe that there is no limit for preciseness of TSF. A possible failure of correction usually is related to inaccurate estimation of the deformity and mounting parameters and in most cases might be avoided. We have asked if TSF can accurately correct deformities in immature patients with multiplanar deformities. Despite the fact that most patients in this study had complex deformities, the TSF corrected most deformities precisely. Most patients had no deterioration of deformities at the latest follow-up visit. Ilizarov GA. The principles of the Ilizarov method. 1988. Bull Hosp Jt Dis 1997; 56(1): 49-53. Ganger R, Radler C, Speigner B, Grill F. Correction of post-traumatic lower limb deformities using the Taylor spatial frame. Int Orthop 2010; 34(5): 723-30. Paley D. Principles of deformity correction. Heidelberg: Springer 2002. Ilizarov GA, Ed. Transosseous osteosynthesis: theoretical and clinical regeneration of the regeneration and growth of tissue. Berlin, Germany: Springer-Verlag 1992. Eidelman M, Bialik V, Katzman A. Correction of deformities in children using the Taylor spatial frame. J Pediatr Orthop B 2006; 15(6): 387-95. Birch JG, Samchukov ML. Use of the Ilizarov method to correct lower limb deformities in children and adolescents. J Am Acad Orthop Surg 2004; 12(3): 144-54. Eidelman M, Zaidman M, Katzman A. Treatment of posttraumatic deformities in children and adolescents using the Taylor Spatial Frame. Orthopedics 2010; 33(4): 253-6. Eidelman M, Katzman A. Treatment of complex tibial fractures in children with the taylor spatial frame. Orthopedics 2008; 31(10): 992. Al-Sayyad MJ. Taylor Spatial Frame in the treatment of pediatric and adolescent tibial shaft fractures. J Pediatr Orthop 2006; 26(2): 164-70. Blondel B, Launay F, Glard Y, Jacopin S, Jouve JL, Bollini G. Hexapodal external fixation in the management of children tibial fractures. J Pediatr Orthop B 2010; 19(6): 487-91. Binski JC. Taylor spatial frame in acute fracture care. Tech Orthop 2002; 173-84. Naqui SZ, Thiryayi W, Foster A, Tselentakis G, Evans M, Day JB. Correction of simple and complex pediatric deformities using the Taylor-Spatial Frame. J Pediatr Orthop 2008; 28(6): 640-7. Marangoz S, Feldman DS, Sala DA, Hyman JE, Vitale MG. Femoral deformity correction in children and young adults using Taylor Spatial Frame. Clin Orthop Relat Res 2008; 466(12): 3018-24. Eidelman M, Bialik V, Katzman A. The use of the Taylor spatial frame in adolescent Blount’s disease: is fibular osteotomy necessary? J Child Orthop 2008; 2(3): 199-204. Feldman DS, Madan SS, Koval KJ, van Bosse HJ, Bazzi J, Lehman WB. Correction of tibia vara with six-axis deformity analysis and the Taylor Spatial Frame. J Pediatr Orthop 2003; 23(3): 387-91. Bar-On E, Weigl DM, Becker T, Katz K. Treatment of severe early onset Blount’s disease by an intra-articular and a metaphyseal osteotomy using the Taylor Spatial Frame. J Child Orthop 2008; 2(6): 457-61. Novais E, Stevens PM. Hypophosphatemic rickets: the role of hemiepiphysiodesis. J Pediatr Orthop 2006; 26(2): 238-44. Petje G, Meizer R, Radler C, Aigner N, Grill F. Deformity correction in children with hereditary hypophosphatemic rickets. Clin Orthop Relat Res 2008; 466(12): 3078-85. Rozbruch SR, Segal K, Ilizarov S, Fragomen AT, Ilizarov G. Does the taylor spatial frame accurately correct tibial deformities? Clin Orthop Relat Res 2010; 468(5): 1352-61.